Students from Aytarun Public School raise their hands to answer questions about UNIFIL and the Blue Line. School children from schools in south Lebanon visit the UNIFIL multimedia exhibition marking the mission's 40th Anniversary. A young student signs the visitors book at the UNIFIL multimedia exhibition featuring art by local school children. An Indonesian UNIFIL peacekeeper from MCOU explains why one must never cross the Blue Line. School students and peacekeepers from UNIFIL MCOU in a group photo. As the school year in Lebanon winds down, teachers and students prepare their end of year celebrations and look forward to the summer break. It is a time for reflection. The team in UNIFIL’s Military Community Outreach Unit (MCOU) are also using this time to look back on the past year and to thank all the schools that opened their doors to them. MCOU are a small unit in UNIFIL made up of 25 military peacekeepers from Italy and Indonesia assisted by a small team of national staff. Their task is to engage with young people from across south Lebanon. 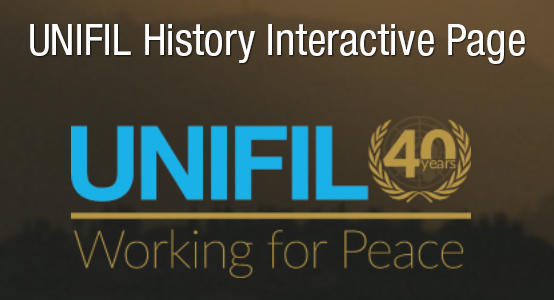 MCOU visit schools, initiate conversations, answer questions and show how UNIFIL works for peace. They have had a busy year - since December 2017 they have visited 30 primary schools, 7 secondary schools and 7 Universities. MCOU have interreacted with approximately 3,000 young people.